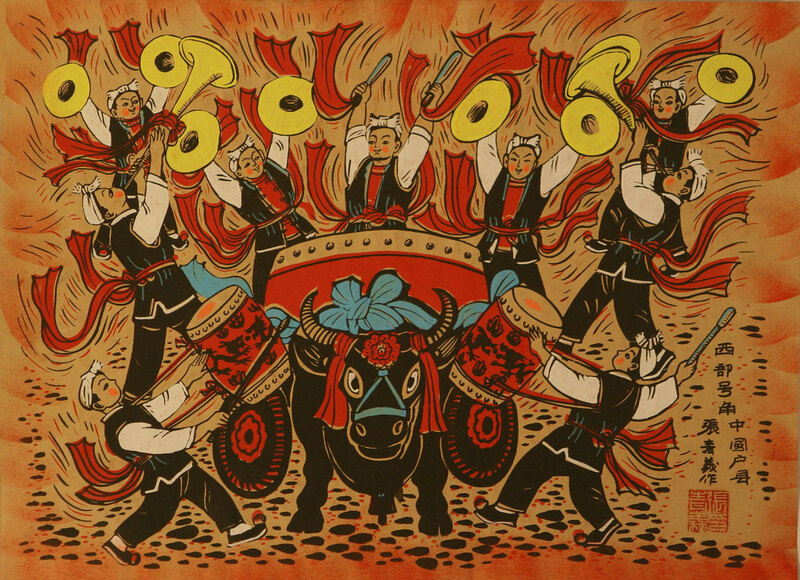 54cm x 39cm ≈ 21¼" x 15¼"
This painting features a group of men from from an ethnic-minority in Gansu Province in a typical scene of celebration. Large bugles dominate the the sounds created by the men, as the beat of drums and clash of cymbals fill the background. 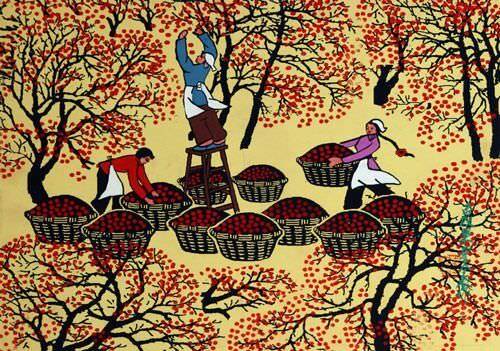 This painting is by (Zhang Qing-Yi) from Huxian County in the Shaanxi Province of China. 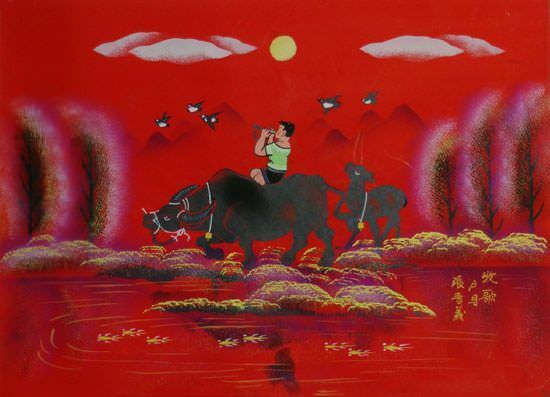 The artist used "shui fen" (paint powder and water - similar to gouache), on thick paper to create this painting. 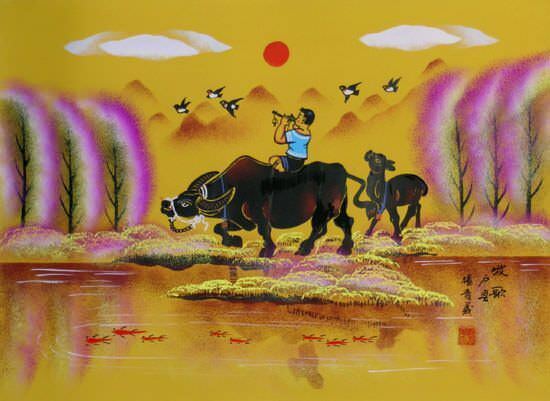 If you get a piece of mat board cut for you, this Chinese painting will fit nicely in a standard 18" x 24" frame. If you want really wide matting, you could even use a 22" x 28" standard picture frame. You should probably get the matting cut professionally, but you can probably handle the rest yourself. Please see our step by step guide to framing Asian art if you want some tips. 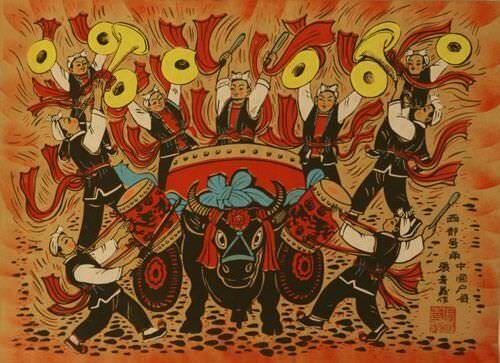 This style of folk art was born in the 1950's just after the Revolution (when Chairman Mao took power). The art developed independently in Huxian (Hu County) in the Shaanxi Province for many years (the same Province where you will find the Terracotta Soldiers). Things changed drastically when the Cultural Revolution came to pass in China. Within a few years, art was only acceptable if it portrayed some form of socialist propaganda, or showed some form of working together in pursuit of Mao's Communist ideals. 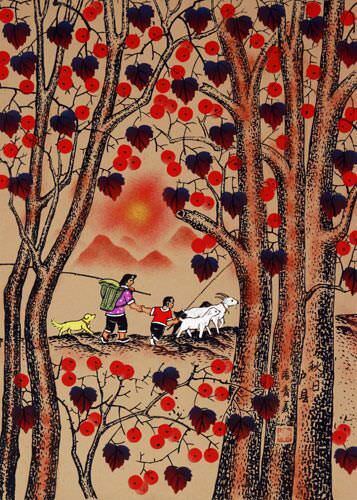 This propaganda art seldom provided any pay for the artist who were instead forced into working hard in the fields as peasants on communal farms to survive. As the last of the Cultural Revolution sputtered to a stop with the death of Chairman Mao in 1976, freedom began to slowly ring again when Deng Xiao-Ping took power. Deng Xiao-Ping brought China out of the dark ages, and away from "Maoism" and Communism (one of the greatest leaders in Chinese history in my humble opinion). By the 1980's, freedom to once again practice 3000 years of artistic tradition emerged. 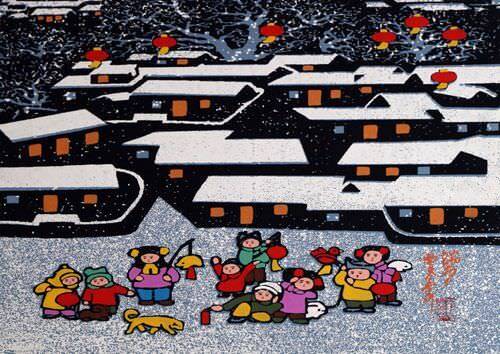 Chinese folk art was finally allowed to be what it was meant to be, a way to freely express various scenes of daily life and snapshots of Chinese village culture. 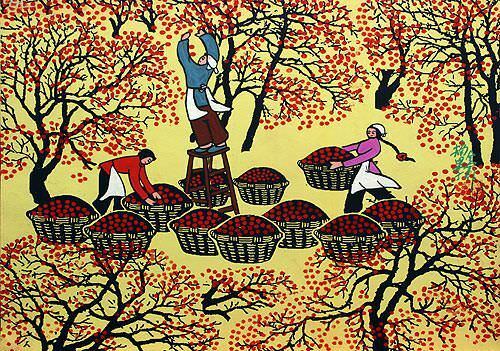 According to Chinese Government statistics, there are now more than 2000 folk artists in Southern China. 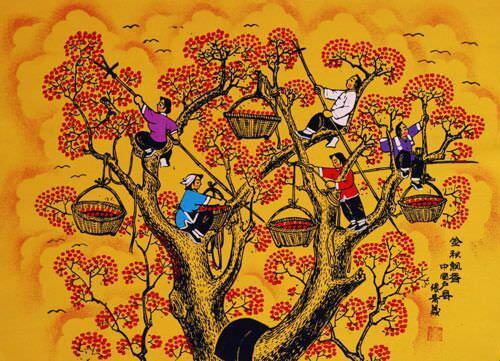 Sixteen of these artists have been recognized as the "Famous Masters" of Chinese folk art by the Chinese Cultural Arts Bureau. 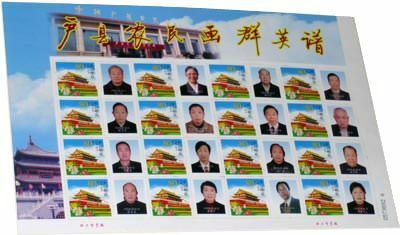 These sixteen artists were recently honored by China Post with the issuing of a set of commemorative postage stamps. Of these sixteen masters, we represent three of them: Pan Xiao-Ling, Cao Quan-Tang, and Zhang Qing-Yi. 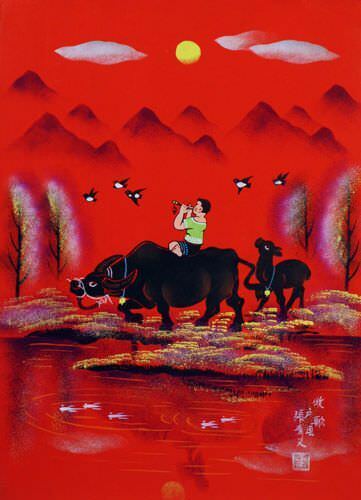 A lot has changed in the folk art community of China since I first started selling these paintings about 4 years ago. 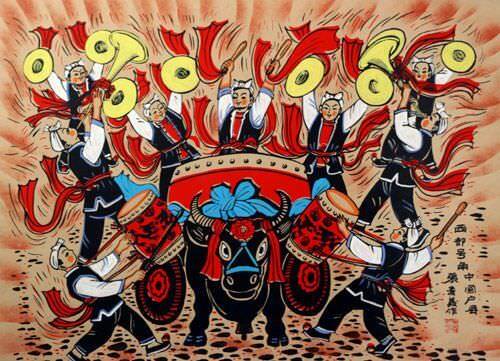 Chinese folk artists have become rather famous, and sought after for exhibitions around the world. Recently these artists formed a labor union of sorts, to ensure that they receive a handsome sum for all of their paintings. 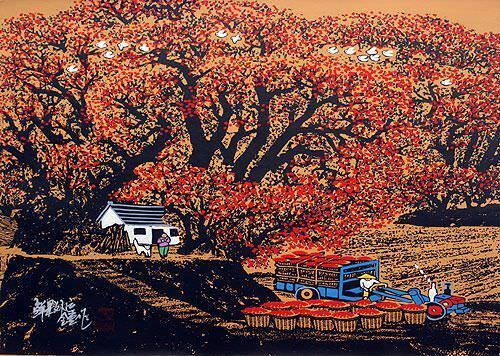 Most of them have been able to improve their station in life through the sale of their artwork. One of these artists once said, "We've become good little capitalists, just like President Nixon dreamed of".